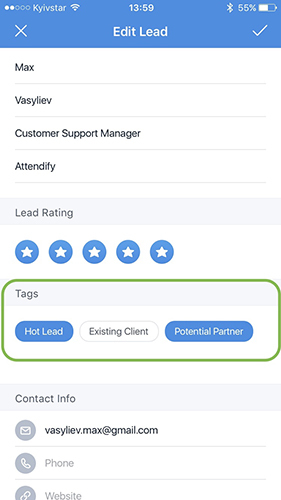 By adding tags to the leads form, you can help your booth staff members categorize new sales leads to easier manage and organize the list of prospects later on. To add Tags go to the Settings > Tags of your Leads dashboard, type the tag's label and click "Add Tag". Your booth staff members will have the option to add tags when adding/editing a lead. You can check the Tags assigned to each profile on your dashboard or export the Archive with this information.